(2011 Summer Comments Challenge) Glow reassures her family that they�ll be safe against a Fierce Ones invasion. Some tribe members get into position to guard against or track the Fierce Ones, while others prepare and support their kin. (2014 Secret Santa) Far from home during crisis, a memory keeps Kestrel warm. Kestrel pushes her gliding ability to its limits, while Blacksnake joins Brightwood and Farscout in trailing the humans � and finds that the elves are not the only ones following the Fierce Ones� trail north. Cloudfern and his team must reclaim Bluestone Cave, while Windburn contemplates the other humans the tribe has to worry about. All of this, Crackle thought, wasn�t supposed to happen. This all made for great story material, but not for situations in real life. Blacksnake, Brightwood and Farscout have some unwelcome encounters and make a very unwelcome discovery, while Goldspice tends to the tribe as acting-chief at the Holt, and One-Leg expresses his opinion regarding the situation as it regards the local humans. (2013 Sept/Oct Fic Trade) During the tense times, Thornbow has a chance to ask a question that has crossed his mind once or twice. (2012 July/August Fic Trade) Newt struggles with uncertainty and new responsibilities. (2014 Sept/Oct Trade) Cloudfern is tired and just wants to tend to Otter's arm before he sleeps. Newt decides it's time to have a talk with Cloudfern. Otter learns a lesson about providing for the tribe. 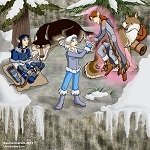 Snowfall, Beetle and Windsong lurk on the edges of a Fierce Ones camp, while Rainpace and Dreamflight endure a cold watch-post; Farscout, Brightwood and Blacksnake spy on the main Fierce Ones group, as Windburn and Foxtail debate the severity of the situation; True Edge listens to Crackle�s doubts, and One-Leg, Pathmark and Notch run into some unexpected problems on the Bounty River. As a winter blizzard looms, the tribe reacts to Notch�s unconventional means of rescuing his father and Pathmark from discovery by the local humans; Rill prepares for an adventure of his own; and Blacksnake finds more than he�s looking for in the depths of the storm. Some things hit you hard, no matter how far you are away. A best friend in dire need triggers something in Fadestar. (2013 Treasure Hunt) Spring meant new life, warmth, and hope. 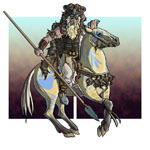 Scouts trail the Fierce Ones south as the hunters leave the nothern steppes. Honey finds that she's lost old callouses. Did the arrival of the Fierce Ones affect Cinder more than anyone thought? (2014 Jan/Feb Trade) Murkfur and Windswift both want to be chosen as Rainpace�s new wolf friend. Fadestar relives a moment that could have ended much differently. Fadestar has been pushing herself too hard and Newt is worried. Windburn and Kestrel discuss a new venture, while life for the tribe goes back to normal. 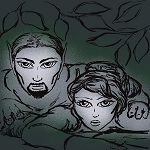 Illustration for "The Gathering Storm Part 5"